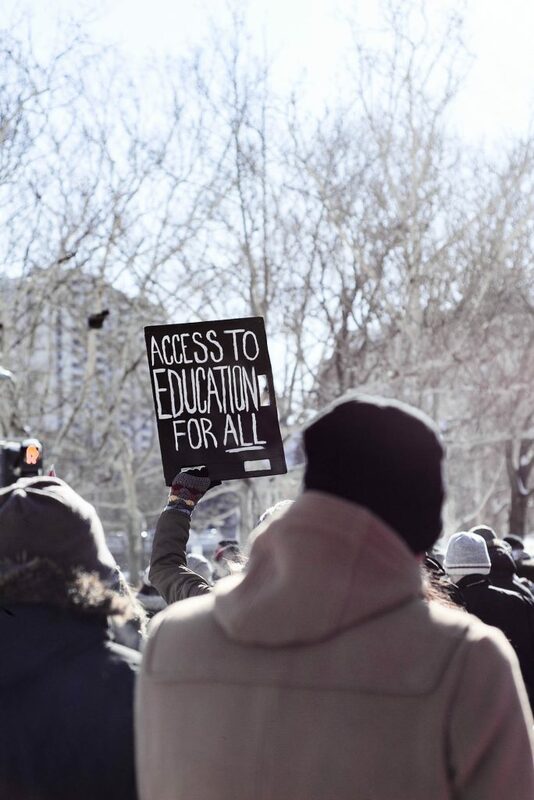 On Feb 1, the Hamilton Student Mobilization Network, a local activist group, hosted a rally at Gore Park in downtown Hamilton to protest the government’s proposed changes to the Ontario Student Assistance Program. The event featured various speakers including Angie Perez, president of the Canadian Union of Public Employees 3096, and Sandy Hudson, co-founder of Black Lives Matter Toronto. “Students have gone to strike for less,” HSMN organizers said at the event. Beyond the issue of OSAP, various speakers advocated for completely free tuition. All stressed the need to support grassroots student activism. The protest downtown followed a protest in the McMaster University Student Centre on Jan. 31, where the HSMN called out the McMaster Students Union for failing to advocate for the student body effectively. Multiple musicians and poets were also featured at the two-hour long rally, performing pieces on the issues of capitalism and gentrification. Hudson stresses the power of students, pointing to the success of Quebec student organizers. 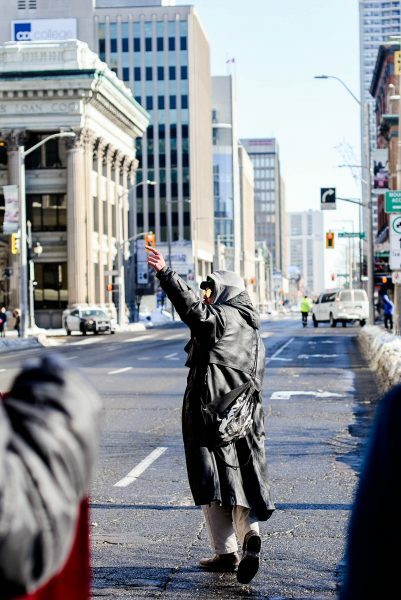 “It is a strong sense of solidarity, a strong sense of agitation, and a strong sense of annoyance,” one protester said when asked why he attended the rally. After an hour of speakers and performers, the protest took to marching on the streets, stopping traffic around the downtown area. The HSMN was launched in the first few weeks following the government’s announcement on Jan 17. 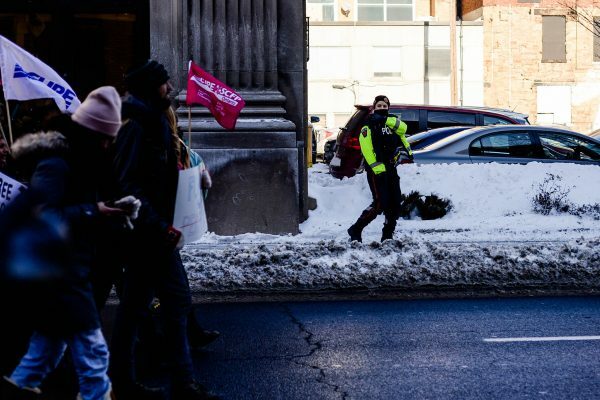 The organization strives to equip activists to mobilize against shared struggles and is mostly run by students and workers from McMaster University and Mohawk College who had already been organizing separately. “We started having conversations about what it would look like if we came together on campus across campuses across the city and really bolstered a more cohesive body of resistance,” Vic Wojciechowska, a HSMN organizer and McMaster student, said. Though the rally was centred on the changes to OSAP, the HSMN is also focused on the adverse effects that cutting tuition and student fees will have. Wojciechowska pointed out that McMaster is set to lose $22 million in funding next year, with no additional funding from the government to offset the loss. “We are looking at suffering quality of education given that there will probably be increases of class sizes. We are looking at part-time staff, faculty associate professors being made vulnerable, anyone that really does not have security or stability of tenure or status in the organization,” Wojciechowska said. “There are a lot of communities being affected by this, not just students on OSAP,” they added. Nonetheless, changes to OSAP will not make it easier to afford tuition anyway, according to Wojciechowska. The HSMN is also very concerned that the option for students to opt-out of certain student fees will jeopardize some student services. “We need to really come together as a community and realize that services we do not use today we might need tomorrow. We need to support services for each other and recognize that student fees help build a stronger, healthier community,” Wojciechowska said. For the HSMN, the rally represents only the first step in what they hope will be sustained student mobilization and advocacy. “It represents an entry point for a lot of students to mobilize around these changes and we are going to be having a sustained campaign,” Wojciechowska said. The HSMN has not released any other planned actions to the public at this point.